Amnesty International India said on Friday that the Union government is treating human rights organisations like criminal enterprises in the wake of searches by the Enforcement Directorate at its premises. The ED on Thursday conducted searches at two locations of the rights watchdog in connection with a foreign exchange contravention case. "Government authorities are increasingly treating human rights organisations like criminal enterprises," Amnesty International India executive director Aakar Patel said in a statement in Bengaluru. The searches were in connection with alleged violation of foreign direct investment norms that is linked to an earlier case of revocation of Foreign Contribution (Regulation) Act licence of the NGO by the Union Home Ministry in 2010. "As an organisation committed to the rule of law, our operations in India have always conformed with our national regulations. The principles of transparency and accountability are at the heart of our work," Patel said. The focus of ED's questioning was the relationship between two entities -- Amnesty International India Pvt Ltd and Amnesty International India Foundation, it said. Most of the documents asked for during the search were available in the public domain or were already filed with the relevant authorities, the watchdog said. Details of Amnesty India's current structure, which was the focus of much of the questioning, have been available on its website since 2014, the statement said. However, ahead of the raids, the Indian authorities leaked a cache of their internal documents marked 'secret' that appear to cast Amnesty India's operations as a dark web of intrigue, the statement said. "Our work in India, as elsewhere, is to uphold and fight for universal human rights. These are the same values that are enshrined in the Indian Constitution and flow from a long and rich Indian tradition of pluralism, tolerance and dissent," Patel said. "We could not agree more with the Prime Minister when he says that periods of repression, like during the Emergency, have left a stain on India's history. Sadly, those dark days are now casting a shadow over India again. "Instead of protecting human rights, as it vowed to do, the government is now targeting the people who fight for them," Patel said. Over 40 lakh Indians have supported Amnesty India's work over the last six years and around one lakh Indians have made a financial contribution, he said. Amnesty India said its bank accounts have been frozen by the Enforcement Directorate, effectively stopping its work and it is the latest target of the governments assault on civil society in the country. The accounts of Greenpeace India were frozen earlier this month, it added. Around 1.30 pm on October 25, a group of officers from ED entered the premises and locked the gates behind them, the statement said, adding that they ordered Amnesty India staff to remain in office, shut their laptops, and not use their mobile phones. 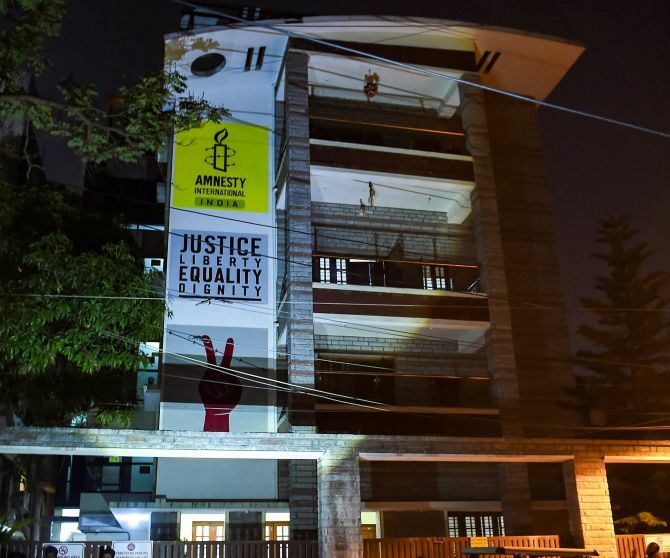 Earlier, in a series of tweets, Amnesty India said its structure is compliant with Indian laws and ED raid showed a disturbing pattern of government silencing organisations that question power and also wants to instill fear among civil society organisations. '...We reiterate, our structure is compliant with Indian laws,' Amnesty India said in a tweet. The watchdog also said the 10-hour long raid conducted at its office ended midnight and the staff had fully cooperated with officials. 'This entity has received foreign funds through commercial route to the extent of Rs 36 crore till date,' it had said. Out of the total amount of Rs 36 crore, it said, Rs 10 crore was received as long term loans. 'This amount was immediately placed in FDs (fixed deposits) and another Indian entity Indians for Amnesty International Trust (IAIT) had established an over draft facility for Rs 14.25 crore keeping the said 10 crore FD as collateral which means the receipt of FDI by trust only. 'The remaining Rs 26 crore was received in two other bank accounts of AIIPL as consultancy services. The inwards remittances received by the AIIPL from overseas is in violation of FDI guidelines,' it had said.